This week the Calumet County Sheriff’s Office released their report. That has led to new answers to outstanding questions, but also completely new, unknown information and questions about the investigation. 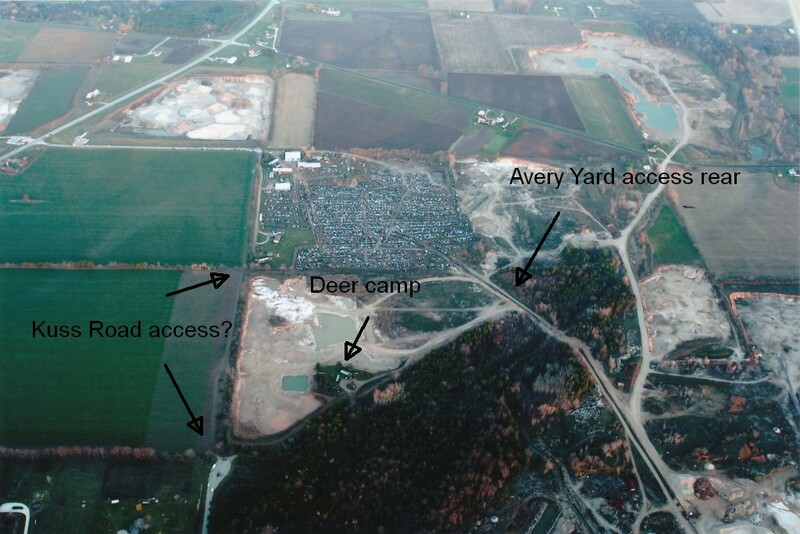 One of these is the Radandt Deer Camp which is located due west of Steven Avery’s trailer off of a cull de sac called Kuss Road. The report has also revealed that the dogs searching for human remains got a hit leading that direction. Another person on the Reddit subreddit for MakingAMurderer, https://www.reddit.com/r/MakingaMurderer/ , said that Earl Avery said there were connections between the Avery yard and Kuss Road. Kuss Road also interlinks to the Radandt Quarry south of Averys (rightward in these photos) where supposedly another burn area and bone fragments were found. We also learned that a FIFTH burn barrel was collected from the Deer Camp. Great observation JL! I never noticed these before. Very interesting that LE made no mention of these tracks. But I am not surprised.